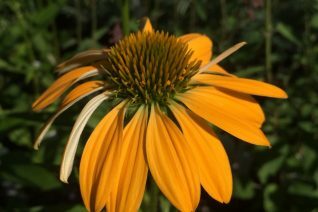 We love this seed strain of Echinacea the least of which is that they seem to establish and over winter in a superior way. Multiple colors in these hybrids from reds to orange and yellow. large up facing flowers with a central fragrant yellow cone. Clump forming perennial for rich soil that is very well drained with consistent light irrigation in summer. Blooms naturally appear fro July to September- and occasionally longer. Remove spent flowers and more will likely appear. Great pollinator plant. Awesome cut flower. Over winters better if there is plenty of oxygen incorporated in the soil. Mulch annually with compost. Full sun to light shade. Excellent in our region on slopes.